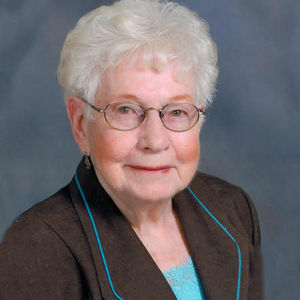 Irene M. Johnson, 96, Wahpeton, ND, passed away Sunday, January 6, 2013, at the Leach Home, Wahpeton. The Funeral Service will be Thursday, January 10, 2:00 PM, at Vertin-Munson Funeral Home, Wahpeton, with Rev. Morris Stephens officiating. Visitation will be one hour before the service at the funeral home on Thursday. Interment will be at a later date at Wildwood Cemetery, Wheaton, MN. Irene Matilda Johnson was born June 12, 1916, in Viborg, SD, the daughter of Carl and Elida (Carlson) Pearson. She left home at the age of 16 to live with her uncle and aunt, Adolf and Fanny Oslund in Minneapolis, MN. She worked at Kickernick Mfg, sewing women's clothing. She met Olaf W. Johnson and was married on September 5, 1936. They moved to Wheaton, MN where Olaf operated a blacksmith and welding shop. In 1954, they moved to Viborg, SD to take over the family country grocery and gas station at Pearson Corner. In 1958, they moved back to Wheaton, MN where Irene worked for Celeste's Dress Shop and baked for Wheaton Cafe. Olaf passed away January 1, 1980, Irene later moved to Wahpeton. She worked at the thrift store and for NDSCS in the cafeteria until 1989. She entered the Leach Home in December of 2011. Irene enjoyed playing cards with her close friends and also playing cards at the senior center. She loved to bake and was known for her donuts and pies. She also crocheted, giving away many afghans and slippers. She belonged to the Eagles Auxiliary and spent many Saturday mornings setting tables up for big events. Irene is survived by her daughter and two sons: Judy Hausmann, Dennis Johnson, and Mark Johnson, all of Moorhead, MN; five grandchildren: Holly (Paul) Carpenter and Jason (Jessica) Johnson, both of Yorktown, VA; Ginger (Mark) Hendrickson, Devils Lake, ND; Darcy (Ryan) Jackson, Moorhead, Alec Johnson, Fargo, ND; and ten great grandchildren. She was preceded in death by her parents, Carl and Elida Pearson, her husband Olaf, her long time friend, Lamoine "Bud" Breuer, four brothers, Clyde Pearson, Henry Pearson, Robert Pearson, Allen Pearson, and one sister, Alvina Lee. Irene was such an amazing person. She was such a wonderful friend to my grandpa, we couldn't have asked for anyone more special than Irene to be part of our family. She will be greatly missed. My thoughts and prayers are with you. So sorry to hear of the passing of Irene! Our family spent a lot of good times with your family when we were growing up and I have many fond memories! My thoughts and prayers are with all of you! Sorry to hear about your Mom, oh my she lived a full life. She hated to leave you guys because you were so good to her. She loved you very much. I won't be able to make the funeral, but know that I hold you all in my thoughts and prayers.